I know the title of the recipe carries a big name, but it’s true, this is the BEST EVER butternut squash soup. Most butternut squash soups taste like squash puree and not much else, but this soup has so many flavors and a lot of depth. I absolutely love this stuff. It actually worked out that this recipe was my best use yet of my delivered organic produce. I ended up having the first five ingredients in last weeks box. Score! It was a sign that this soup was meant to be. One thing that I really love about this soup is that it is thick because of all the veggies in there, not because of any flour or cornstarch like most soups. 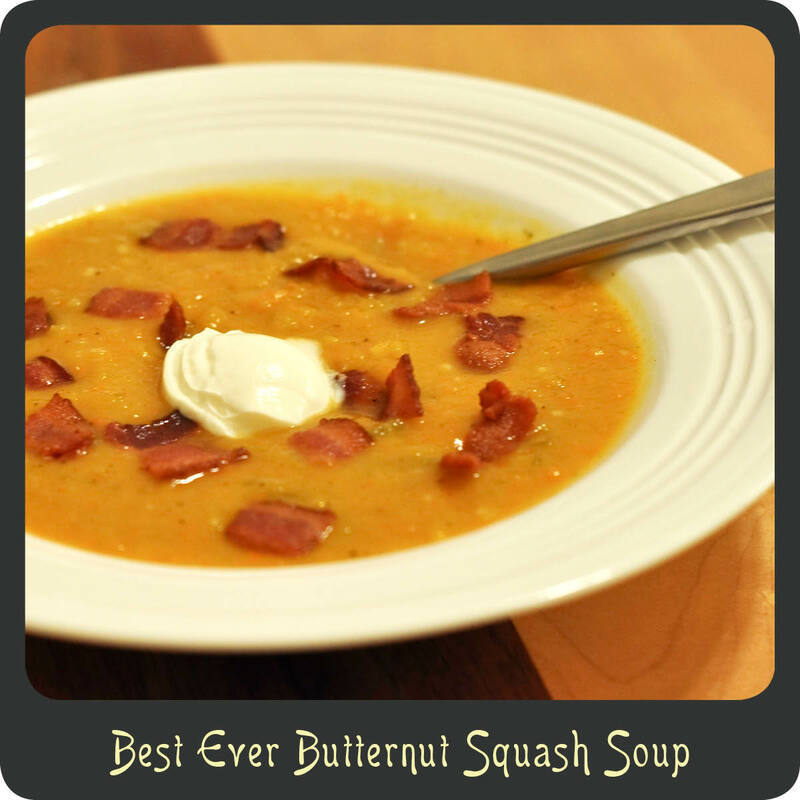 If you are looking for a fabulous fall soup, look no further. This will fit the bill. Notes: Most of your time making this recipe will be spent chopping veggies. To save some time, you can buy packages of pre-chopped butternut squash at the store. It will cost a little more but will shave off quite a bit of prep time. This soup can be made vegetarian but cutting out the bacon and replacing the chicken broth with vegetable broth. You can use a hand mixer or blender to process the mixture. The hand mixer will give you a slightly chunkier soup and the blender will give you a really smooth one. If you use a hand mixer be sure you don’t use a non-stick pot, as the hand mixer will destroy it. If using a blender you will need to do it in batches. I recommend placing a towel over the top of your blender and holding the lid firmly in place as the heat will make the lid blow off and it makes a huge hot mess and can burn you if not secured. In a large soup pot, cook bacon over medium-high heat. Remove bacon and drain off grease leaving 2 tbsp in the bottom of the pot. Sauté onions and carrots in the bacon drippings for about 5 minutes. Add in the celery, apples, and garlic and sauté for another 5 minutes. Add in the squash and broth. Bring pot to a boil, reduce heat and simmer for 20–25 minutes or until all produce is fork tender. Using a hand mixer or blender process the mixture until smooth. (See above note) If you use a blender return the soup to the pot. Stir in the lime juice, honey, salt, pepper, allspice, nutmeg, cayenne pepper, and whipping cream. Simmer soup for 10–15 minutes or until thickened. Using a ladle serve the soup into a bowl and top with crumbled bacon and a dollop of crème fraîche or sour cream.